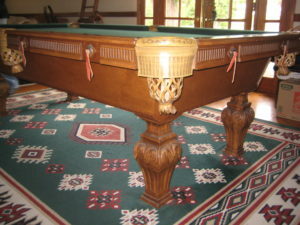 Here’s a nice western themed pool table in Yorba Linda, CA. We were called out to disassemble and move this 8′ three piece slate pool table. The homeowner was down-sizing and didn’t have room for it in her new home. So rather than just sell it for practically nothing , she rented a storage unit and hired us to move her western style pool table. When we arrived at the unit, it was pretty full already. We were able to move some things around and accommodate her pool table. An 8′ slate pool table, once disassembled correctly, takes up very little space. I’ve had customers who have successfully stored stored their disassembled pool table for years. It’s a good idea to wrap the felt up in a plastic bag to keep out any moths or bugs that may like to nibble on the wool. Pool table felt is made up of 75% wool. Another good idea is to keep the hardware together with the small parts of the table.